With Remembrance Day this month, and the 100th anniversary of the end of the first World War, Toronto-based author, Lindsay Mattick, releases a new children’s book, Winnie’s Great War. Based on her great grandfather’s connection to the real Canadian bear cub that went on to inspire Winnie the Pooh, Captain Harry Colebourn’s role during the war time inspired stories that are worth sharing. He was the Canadian soldier that purchased a black bear cub in 1914 for $20, named it ‘Winnipeg’ – ‘Winnie” for short – and donated her to the London Zoo where author A.A. Milne and his son, Christopher Robin, visited and befriended the bear, who, of course, became the inspiration for the world’s most beloved literary character. The novel, which is all told through the perspective of Winnie the bear, uses Lindsay’s great grandfather, Harry Colebourn’s real wartime diary entries, to anchor the story in the real history of the war. Those entries include his description of what life was life at war: training in Valcartier, taking care of the horses, getting sick crossing the Atlantic, witnessing mass casualties at the front lines in Ypres, etc. Winnie’s Great War, which was just shortlisted for the Governor General’s Literary Awards (young people fiction), is a follow up book to the NY Times bestselling Finding Winnie, Lindsay’s first children’s book. When did you first learn about your great grandfather’s diaries? Lindsay: I recall being about eight years old when my grandfather Fred (Harry’s son) showed me his father’s 1914 diary where Harry recorded his purchase of Winnie. I remember from a very young age thinking how remarkable it was to have this moment in time – that went on to have a huge ripple effect – captured in time. What was his role in the army? Lindsay: Harry was a Canadian veterinarian and soldier with the Royal Canadian Army Veterinary Corps. Harry was part of Winnipeg’s Fort Garry Horse regiment. Harry trained in Valcartier, Quebec before embarking for overseas duty in Salisbury Plain. He served three years in France, attaining the rank of Major. He purchased this bear cub for $20. Did you know how or why that happened? Lindsay: The truth is we don’t know for sure why he bought her. Harry may have wanted to buy a mascot for his regiment, he may have wanted to rescue the sweet cub he met. Whatever it was, it was definitely fate. In your first book, Finding Winnie, it tells the story about how Winnie became famous after inspiring author A.A. Milne to name his classic children’s book Winnie the Pooh? Tell us how that came about? Lindsay: I first conceived of the idea of telling my family story as a picture book a decade before I had children. 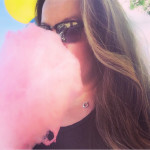 I thought it would be an incredible way to share my family story to my own kids. When I found out I was pregnant with my first child (Cole) I realized that if I didn’t write it then, it would take me another decade… in short this book was FOR my son Cole, but also BECAUSE of him. Tell us what inspired you to write a second book? 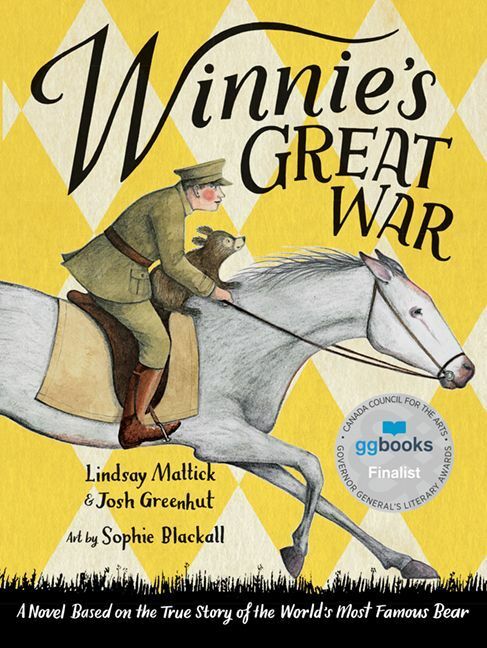 Lindsay: Winnie’s Great War is a middle grade novel that takes off in many ways where Finding Winnie left off. I offer to tell my son Cole, who is much older now, the real story of Winnie and his great, great grandfather. He assumes he knew the whole story but of course he didn’t. I think the novel allows us to explore a lot of themes we could not in my first book – bravery, self-sacrifice, courage and communication are all ideas we have a chance to explore in a more fulsome telling. In my experience traveling the world to share Finding Winnie, kids want to understand more about this story and what it all meant. Winnie’s Great War answers many of their wonderful questions. This book is told through the eyes of Winnie – what made you decide to take that whimsical approach? Lindsay: The novel is anchored by my great grandfather’s real wartime diaries which is a constant reminder to kids that much of what they are reading is of course, true. I think by having the story told through Winnie’s perspective, it allows kids to see the events unfold through a unique and innocent perspective – in a way, the way Winnie as a young cub views the events unfolding in front of her is not dissimilar from how a child would view the events. This book also takes into accounts some of the events that took place during the war. Your research included experiences as told through your great grandfather’s diaries. What’s one part of this history really was important for you to tell? Lindsay: From the outset, including the real diary entries in the book was very important. We (Josh Greenhut and I) wanted kids to understand that while Harry recorded happier moments – like purchasing Winnie –he also wrote about more difficult days – like getting sick crossing the Atlantic en route to war, witnessing mass shelling and casualties, etc. I wanted kids to get the full picture of that experience and why those realities made Harry and Winnie’s story all the more remarkable. What happened to your grandfather’s diaries? Will they ever be published? Lindsay: They are currently on display as part of an original exhibition I worked on with Ryerson University called Remembering the Real Winnie which also exists online http://therealwinnie.ryerson.ca/collection/ On that site people can read all of Harry’s entries.. It’s something I’m very proud of. Your favourite Winnie the Pooh Quote? Winnie’s Great War is now available in bookstores and online. Link here for more details.